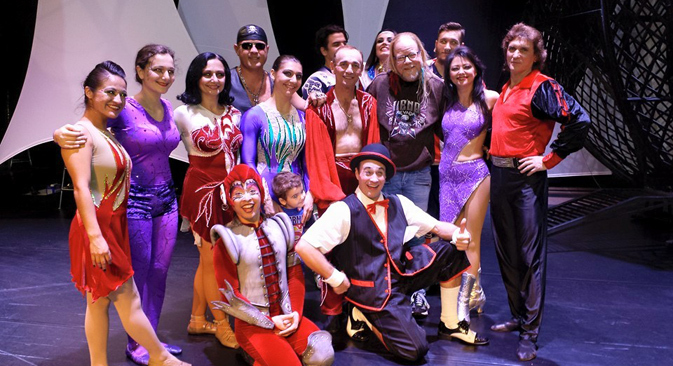 25 years after first watching a Russian circus show, journalist Kim Palchikoff is still in awe. If there's one word I would use to describe my feelings for the circus performers from the former Soviet Union, I would have to say it's the word “respect.” Many people might use the word "entertaining," or "terrific," or even "unbelievable." But I use the word “respect.” Why? Because watching them over these past 25 years I have seen both the light and dark side of their globetrotting life, and I know how much work they put into their famous death-defying acts that have kept the world in awe for nearly a century. Performers practice every day, and they take it very seriously. It takes years sometimes to come up with a high level marketable act high paying impresarios want to hire, and whether it's balancing on a ladder or throwing tricks off a trapeze, the Russians never do anything that comes easy. They suffer injuries, sometimes fatal. I watched a trapeze flier fall 35 feet to the ground, head first. He almost died. He spent a year in the hospital recovering. Performers often suffer from back problems. Anyone who thinks that life in the circus is easy, or just a barrel of laughs, doesn't know much about the life behind the curtain. Performers have to go on stage every night, whether or not or they are in pain from an injury, which is often. Theater and ballet productions have stand ins. Circus performers do not: They all do their own unique tricks that have taken years to perfect. Working and traveling as a family act is not an easy feat. Sounds like fun? Not always. Many performers do it, because the alternative is to leave their spouse and sometimes children behind for months at a time. As one performer told me once, working and living with your family 24/7 means you don't get a break from each other. I have watched them spend hours training their children for hours every day, year after year, to pass down their own profession to the next generation. Starting when their children are toddlers, in their living rooms, they invest thousands of hours with their children, teaching them everything they know so that they, in turn, can become professional entertainers themselves. It's not an easy job. It takes a lot of patience. Like for many in the world of entertainment, circus contracts don’t always come easy, and rarely last more than a year. But thankfully, they love what they do and they’re the world’s best. Where would the world be if all the Russian circus performers became bankers? I respect them for their high level of professionalism the complexity of their tricks. Their clowns, for example, are not amateurs randomly walking around in a colorful costume squirting water guns or honking horns. They are professional comedy actors and mimes who juggle, play instruments, train animals, and much more. For 25 years I have watched their breathtaking performances, and never do they cease to amaze me with their well thought out, one of a kind tricks, their ability to combine professional level theater, ballet, comedy, gymnastics, balance, aerial acrobatics and other often dangerous tricks. The performing art of circus, unlike opera, ballet and theater, is all about tricks. And the Russians do the most complicated tricks I’ve ever seen. To spend a life under the big top, you have to passionately love what you do. Life may be hard, but it has its rewards. Many Russian performers can’t imagine not traveling and working with their spouse or their children, all doing what they know and love best. They choose to be world class entertainers, they choose their life in the red ring, be it in Las Vegas, Orlando, Milan or Moscow. They love the night life, and are in their element whether it’s back stage putting on their costumes and make up, or on a big stage entertaining thousands. And I am so glad. It’s a tough world we live in these days. Which is why I, like millions around the world, turn to the traveling circus when it comes to town for a few precious hours of hearty laughter and magical amazement that make me forget my woes. Hail to the circus photographers!